At an altitude of 1,270 meters, it is the highest village on the island and one of the oldest as well. Vacationers are never deterred by the challenging road ahead, as the drive up offers spectacular panorama, and the destination is sure to impress. Abundant with natural and archaeological marvels, this serene mountain village provides the perfect vacation experience for every type of traveler. Hailing from the North of Africa, the original inhabitants of Artenara were a tribe of Berbers called the Canari. They excavated mountain rocks to create cave dwellings and shelters, and left the rest of the land for farming. Archaeological evidence proves that the Berbers have settled in this mountainous area 1,000 years before the Spanish conquest. Up to this day, the relics of their ingenuity persist to be one of the primary reasons for the development of Artenara. There are plenty of things to see and do in the lovely village of Artenara. Visit the cave houses and churches, and wonder how bare hands and a few tools can create such beauty. Hike in the magnificent mountains filled with lush groves of pine trees, and admire mother nature’s greatest masterpiece. Look as far as the eyes can see while standing on a mirador and ponder what could be on the other side of that rock formation. In this part of the island, caves are a necessity, then and now. And they have at least one for every purpose one can think of. 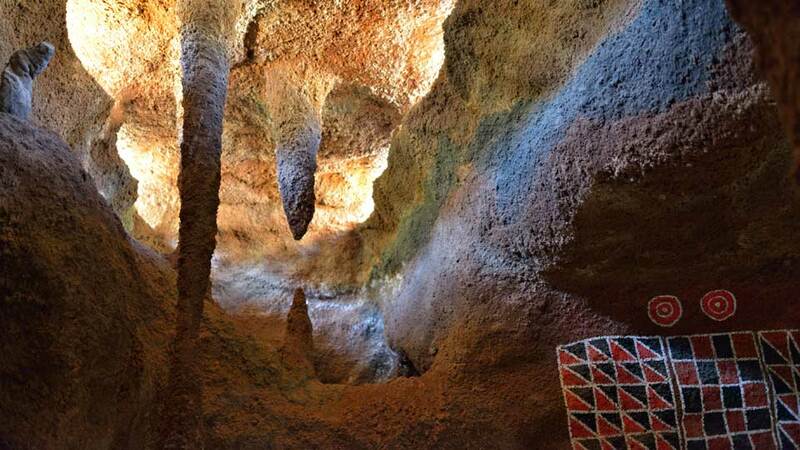 The 12 caves of Cuevas de Caballero were once used as shelters by the native shepherds. It also exhibits the unique use of symbology by the early inhabitants of Gran Canaria. On the other hand, the La Cueva de Los Candiles has wall decors and drawings. Some caves were also of astronomical and agricultural importance, like the Cuevas de Risco Caído. Each cave has a window in the ceiling where sunlight comes in to signify the coming of the summer solstice and the moonlight for the winter solstice. Religion is significant for the people of Gran Canaria. So, in Artenara, of course, they have an ecclesiastical cave. The cave church La Ermita de la Cuevita, which houses the statue of Virgen de la Cuevita, was carved into a cliff side in the 18th century. Furthermore, the altar, lectern, confessional and choir seats, and everything else in it is also carved out from the rock. Perhaps the most popular of them all, the La Casa Cueva Museo Santiago Aranda (Museum of Cave Houses), is exactly what its name suggests. It has 7 cave houses setup differently depending on its functions, and each one showcases 20th-century cave dwelling. Tourists love this museum, not only for its caves but also for the stunning views of the mountains and the valleys of central Gran Canaria. Miradors or lookout stations are the best spot for tourists to see the beautiful surroundings. And in the majestic Artenara, there are three… Because having just one is simply not enough. Reminiscent of the colossal Christ the Redeemer of Rio de Janeiro, the statue of Jesus on the Mirador del Cristo is smaller, but just as awe-inspiring. It stands on a globe held by two kneeling angels and is the first thing that welcomes everyone as they approach Artenara, and what a welcoming view it is. While already impressive from afar, much more glorious views from the Mirador itself await those who are willing to walk up its mountain. Constructed in 1999, Unamuno’s Balcony is a tribute to Miguel de Unamuno, a famous educator, philosopher, and author, who stayed on the island in 1910. 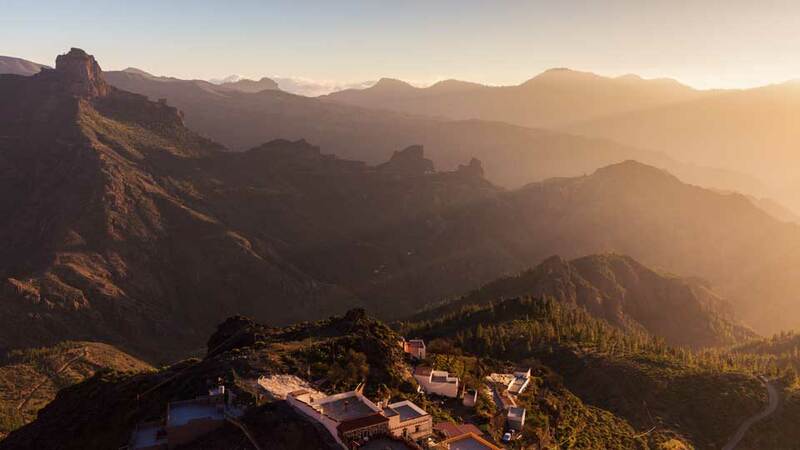 Seeing the wonders from this balcony is often regarded as the best part of the Artenara experience, as it offers a breathtaking view of the amazing landscapes of Caldera de Tejeda, Roque Bentaiga, and Roque Nublo. The most difficult one to reach is Mirador del Molino, but the grand spectacle from its deck makes it well worth the drive. Built at the peak of a towering cliff, visitors feel like they are on top of the world looking down on such extraordinary natural wonder. With an undistracted view of the vast area that goes as far as Roque Nublo, it’s no surprise travelers take on even the most menacing road in Artenara just to see it. With its scenic landscape filled with abundant botanical riches, the natural surroundings of Artenara is a hikers’ paradise. 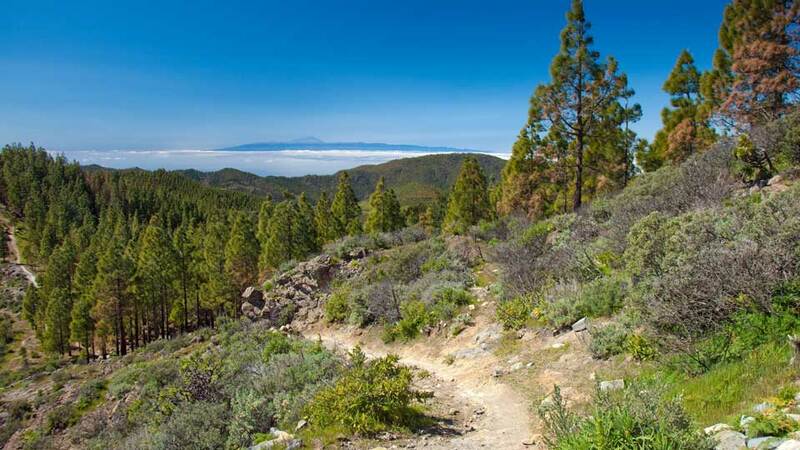 The trails around the Natural Reserve of Pinar de Tamadaba, the largest pine forest in Gran Canaria, provides astonishing views of the Caldera de Tejeda and Tenerife’s Mount Teide. 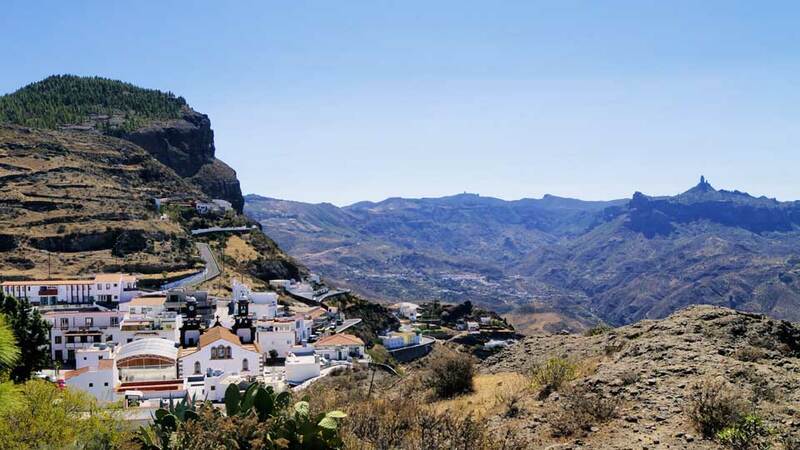 Another recommended trek is through the Roque Nublo Rural Park, the largest natural area in the island, where hikers can admire the seemingly endless network of mountains and enjoy nature in its purest state. Probably the least explored part of the municipality, the secluded coastal areas of Punta Gongora and Punta de Las Arenas are popular among adventurers and surfers. These black sand beaches are worth the hike for those who yearn for solitude while listening to the sound of huge rolling waves crashing onto the shore. Artenara is only 50 km away from the capital Las Palmas. The fastest way to reach the village is by taking a 1-1/2-hour drive by taking the Carretera del Norte (northern road) from the city and pass through Teror and Valleseco. Another option is to travel by the efficient public transport. From Las Palmas, Bus No. 220 also ply the same route to reach Artenara. Please note that this bus trip only has three scheduled departures a day on working days and holidays. 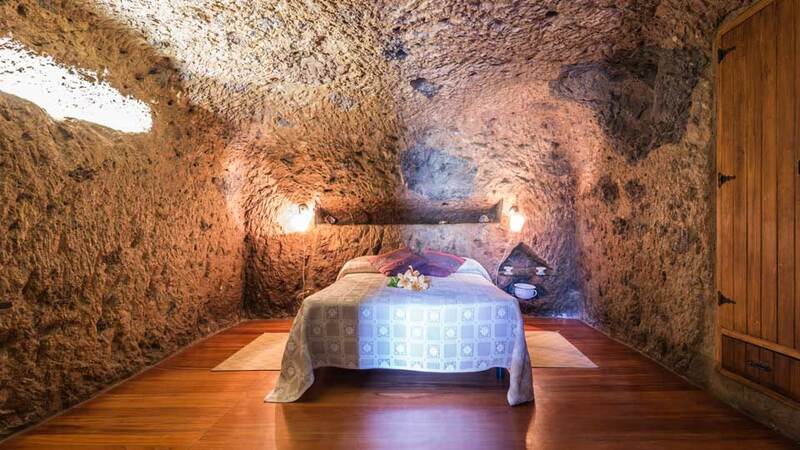 The cave central of Gran Canaria has caves for everything, and they have rental cave houses equipped with all modern amenities so tourists can experience cave dwelling in the 21st century. Perfect for families and group of friends, the Casa-Cueva El Caidero is a big cave house with stunning surroundings guests can appreciate while relaxing by the balcony swimming pool. Complete with great amenities and the best views, it is also near restaurants, shops, and bars. Cave dwelling has never been this easy. Just a few minutes away from the center of Artenara, guests can expect an undisturbed stay in the secluded Casa-Cueva El Pastor. Experience cave living in a magnificent abode built in the Montaña (Mountain) del Toril. Unwind and enjoy the splendid view of the pine forest and clear blue sky from its spacious terrace surrounded by fruit trees. With a fabulous balcony swimming pool and a brick grill station, this cozy house carved out of the rock is a favorite amongst tourists. Have the best barbeque party with family and friends, or just frolic by the pool with the exceptional view of the neighboring mountain as a backdrop. Truly, this charming cave house is a home away from home. Artenara is famous for having the most delicious grilled meat dishes and the best cheese in the Gran Canaria. Travelers rave about the mouthwatering taste of marinated rabbit and fried suckling pig. They also love to snack on local cheese made from a mixture of goat, cow and sheep milk. The papas arrugadas with mojo sauce is also a must try. The Bar Restaurante Tamadaba is favored for their small menu of lovely dishes, this marvelous restaurant is the perfect place for every meal. Try their cheese salad with olives, nuts and peppers, Canarian stew, fried shrimps, and the surprisingly delicious dessert of figs and cactus fruits. It is a fantastic place where diners can enjoy great food with a beautiful setting. A travelers’ favorite for their delectable food, generous portions, and reasonable price, the Bar Restaurante La Casa Del Correo is a must try. The restaurant owner makes fantastic calamari, croquetas, marinated meat, papas arrugadas, gofio, and different kinds of crepes and cakes which guests can enjoy with either local wine or hot choco. They also personally grow most of the fruits and vegetables they serve. Last but certainly not the least, the La Cilla Artenara Restaurant is, without a doubt, the most popular restaurant in Artenara. Guests must enter a cave and walk through a dark tunnel to reach the remarkable terrace where they can feast on great food (their grilled meat dishes are highly recommended) and an outstanding view of the surroundings. It is definitely the best place for travelers who want to have an unforgettable dining experience. Often referred to as “small continent,” vacationers are learning how Gran Canaria earned its moniker. From its picturesque mountains, ravines, and cliffs, to the magnificent lowlands, sand dunes, and coasts, it is truly a continent on its own. But why only stay near the shores when there is so much more to see? With spectacular ancient caves built in solid rock mountainsides, never ending stretch of panoramic views, friendly locals, and the most delightful food, it’s not hard to understand why Artenara is considered a traveler’s paradise. In this small continent, paradise is not a long drive away.